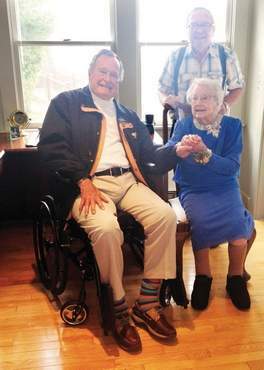 KENNEBUNKPORT, Maine — It’s a wish more than 20 years in the making, and on Tuesday, 105-year-old Millie Rennie’s wish was granted — to meet President George H.W. Bush. Rennie, who lives at The Lodges Care Center in Springvale, knew as fellow residents gathered in the dining room Tuesday that a surprise was coming, she just didn’t know what. But she was ready, wearing a beautiful blue dress with sparkling beading on top, her hair and nails freshly done. “Oh my word,” Rennie said, as Mary Jo Paiva, resident care director at the assisted living facility, told her that she would soon be taking off from The Lodges to head to Kennebunkport — in particular Walker’s Point, where the Bush family spends their summers, to meet the former president. “She keeps up with all the current news. Which brings up her longtime wish to meet George Bush,” Paiva wrote in the nomination letter. “She really does admire him. She was delighted to see him jump from a plane. She always thought someday, somehow, she would get to meet the president. It hasn’t happened yet.” Rennie told Paiva that she’s wanted to meet Bush since she first voted for him. After reading the nomination letter, Simeoni, the administrative supervisor/court officer at the Kennebunk Police Department who founded the YCEATF in 2006, said she turned to Police Chief Bob MacKenzie to help make the connection happen. They both came to The Lodges on Tuesday, MacKenzie presenting Rennie with a bouquet of red roses while Simeoni placed a corsage with a beaded bracelet — homage to Rennie’s beloved “bling” — on her wrist. Simeoni said Rennie has been recognized by Gov. Paul LePage as the oldest resident in the state of Maine. “It gives me butterflies,” she said of being able to grant Rennie’s wish. As she prepared to meet the former president, Rennie thought of the first words she may say to him, coming up with, “I’m here for you.” After sharing in her excitement with other residents, Rennie was whisked away to Walker’s Point, where Bush was waiting. The two sat and talked for about a half an hour, Simeoni said, adding Rennie “kept his hand warm” the entire time. Those involved in Tuesday’s surprise were thrilled to be able to make it happen.